Not the most accurate title but pretty catchy, I think. Yesterday I participated in the ACT Holiday Fair. To keep tabs on me, they placed me between old friends and co-workers, Carol Ogletree and Laura Hoffman. The gift sets of Frannie books, wrapped in miniature crime scene tape, sold well, as did the single copies. I even got a check from someone made out to Frannie Shoemaker! I don't think she has an account. It was great to see a lot of the people I had worked with, and there was a wonderful selection of handmade items--from Jamaican food and cupcakes to t-shirt scarves, jewelry, and Christmas decorations. Dr. Carol, who is one of the Industrial Psychologists at WorkKeys, makes beautiful wreaths and swags, many in a personalized theme. I have taken an oath on a stack of Christmas craft magazines that I would not bring another decoration into this house. We are, after all, thinking seriously about downsizing. But I could not resist the little camping wreath in case I need to decorate the trailer. Carol has wreaths and swags in every color combination and decorated in themes from fishing to chocolate. Personally, I think her talents are wasted in job analysis and statistics--I mean, what's fun about that? Laura was selling cute cloth baskets that her sister makes, and they were very popular. When I was working, I referred to her as my underling, but in reality she kept the wheels turning and especially was crucial in meeting the state contract deadlines. In this photo, Carol, myself, and Laura share grins as we pack up after a successful day. However, they couldn't resist a little joke. The department is in the midst of moving to a different building and in doing so, they came across The Clock. I made this years ago from a piece of packing material left in the hall from new office furniture and a cheap (read, VERY cheap) clock kit. We hung it in the brick-walled hallway of the Lindquist building to see how long it would take for someone in authority to notice it. It actually was several months before it disappeared. A few months after that, someone found it hidden behind the receptionist's desk, which was no longer in use. So we hung it in our common area and at Christmas, little holiday figures would appear in the various ledges. I don't know what happened to it after that, but when I arrived yesterday, there it was by the table assigned to me. Someone is going to get a VERY nice Christmas present, because it's too big for the camper. The five tiny paper houses--two vintage '40s and the others recent reproductions--that sit on a side table in the dining room. I arrange them randomly, like an old Dickens town, interspersed with half a dozen little bottle brush trees. When my grandchildren pass by that table, they suddenly become OCD (something that none of them are afflicted with at any other time) and rearrange them in neat little rows. My own miniature Levittown. I have a village of bigger buildings similar to the popular collectibles, but these are ceramic ones I finished in the early seventies and there are only five of those also. There are trees, fences, lampposts, and a set of plastic people, including an elderly couple who are bent so that you can seat them in the plastic sleigh pulled by a handsome plastic steed. When oldest granddaughter Brooke was six or seven, she loved that village and always helped me set it up. And always after she went home, I would find the elderly couple sitting atop one of the house chimneys, surveying all. Of course, the greatest treasure trove of all is the big tree. I have smaller ones, too, each decorated according to a theme: a cowboy one for the grandsons, a jungle tree for the granddaughters, a bird and animal tree in the basement family room, and a red-and-white snowman tree on the front porch with all of the grandchildren's names on the ornaments, and mittens, sleds, snowflakes and hats. But the only theme for the big tree is the last fifty years of our lives. We have purchased ornaments on almost every trip we've taken and received ornaments from almost every friend and family member. The egg carton reindeer (was there ever an uglier kids' craft designed?) that one of our children made in kindergarten is always on that tree--maybe near the back. There is huge white barbed wire ring with a red and blue star in the middle of it received after I complained to our Texas son that he had never gotten me a Texas ornament. He said this was the biggest he could find. A whole collection of cross stitched trimmings were the gift of a dear friend. A yellow paper bird with a gold foil tail has been on the tree since our first Christmas. There are ornaments from Germany, England, Ireland, Vermont, Florida, Colorado, and California. There is a red glass hummingbird from sister Libby, a hand carved ball from sister Gretchen, and a crocheted egg from a former co-worker. Brooke helped me pick out the Nutcracker figures the year we saw the Joffrey perform that ballet. Actually, it goes back more than fifty years. I also have a pine cone tipped with just a hint of silver--one of many made by my grandmother in the Forties the year she discovered silver spray paint. Each of these and many more evoke their own memories and smiles. And the tinsel. A couple of years ago, I found real tinsel in a catalog--not that nasty plastic stuff. And each year I carefully put it on strand by strand. And giggle as I remember the year daughter Kate was a senior and we also had an exchange student from Mexico, Aurora Flores. The girls were helping me decorate the tree when I was called to the phone in another room. I could hear fits of laughter while on the phone, and when I returned, there was tinsel on the drapes, the lamps, the ceiling fixtures, the pictures, and in the girls' hair. Everywhere but the tree. So I probably won't put this all up next year. Right. I recently saw a blog that featured five places to visit in a cozy town--the towns being sites of several cozy mystery series. 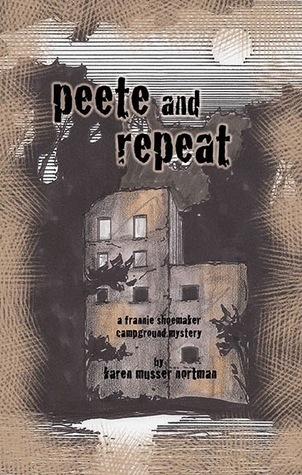 So Frannie stole the idea to describe five of her favorite places around River Bend Campground, the site of her latest adventure, "Peete and Repeat." And, by the way, don't miss the chance to win one of two copies of "Peete and Repeat" if you are a member of Goodreads. I’m Frannie Shoemaker, and my favorite thing about retirement is camping with my husband and friends. We travel a lot of places, usually state parks, but our last trip we stayed in a private campgound in Southeastern Minnesota. Some people think that camping is all bugs and dirt and hard work, but not the way we camp. Let me take you around River Bend Campground. The Shoemaker Trailer: Our camper is a thirty-foot travel trailer. My husband, Larry, and I bought it used several years ago and Larry was not surprised when I made some modifications inside. (He says I will probably rececorate my coffin after I’m dead and buried.) I like a more rustic feel than most newer RVs have, so I recovered the fold-down couch and the dinette benches with blue denim. I didn’t like the beigey-taupe border either so I took it off, painted a stripe and stenciled a border of acorns and oak leaves. A hand-quilted laprobe in navy, red and green made by my mom and throw pillows made from old jeans warm it up even more. Larry’s brown leather recliner, a wrought iron lamp and black cabinet hardware finish it off. We don’t spend a lot of time inside but when the weather’s chilly or rainy, there is no cozier place on earth. The Campfire-The campfire is an activity in itself. Larry and my brother-in-law Mickey argue every trip about how to build a fire. Larry prefers a ‘teepee’ syle and Mickey likes the ‘log cabin’ form. But their spats aside, the fire is where we gather every morning with mugs of steaming coffee and end each day, with glasses of wine, iced tea, or beer. It’s where Mickey plays his guitar while we try to sing. It’s where we argue politics, discuss recipes, and try and solve mysteries. And it’s also where we, especially Mickey, cook up fabulous meals, often in cast iron pots on an ingenious swing-away grill. Near the fire is the picnic table, covered with a bright vinyl tablecloth--the scene of those fabulous meals, games, and crafts. Mickey’s wife and my best friend, Jane Ann, usually provides a wonderful bouquet of her garden flowers in an old canning jar as a centerpiece. The Campground Office: The office is attached to the front of the owners’ residence and usually manned by Mary Louise Larson, one of said owners. Mary Louise almost fills the office, not only with her plus-size body but even more with her joyous personality and booming laugh. She registers campers, sells fresh eggs and a few other groceries, doles out information about nearby attractions, and always lends a sympatheic ear to troubles. Her cat, Phun Munki--so named because of a marked resemblance to a sock monkey--likes to lay on the campground registry and pass judgment on all who enter. The Pie Shoppe: In nearby Reston, an old wooden building serves as a stop for hundreds of cyclists every summer who wish to experience their wonderful pies. Bike racks surround two sides of the building. Over a long counter inside hangs an old chalkboard touting the wide selection of homemade pies available on any particular day. Customers get their own drink from urns of coffee, water and tea, and laminate top tables with mismatched chairs invite them to sit and savor. Which we always do. Sometimes we see the beginnings of a mystery in the Pie Shoppe.